Despite an intention of retiring as Yellowstone National Park superintendent in 2019, Dan Wenk says he’s been told he’ll be reassigned as soon as August over what he assumes is his management of Yellowstone bison. “I feel this is a punitive action but I don’t know for sure,” Wenk told The Associated Press. He wasn’t given a reason and said the only dispute he’s had with Interior Secretary Ryan Zinke was over bison. Ranchers in neighboring Montana have long sought reductions in Yellowstone’s bison numbers because of worries that they could spread the disease brucellosis to cattle and compete with livestock for grazing space outside the park. Wenk and park biologists have said the current population of more than 4,000 bison is sustainable. But Zinke and his staff have said the number is too high, Wenk said, and raised concerns that areas of the park such as the scenic Lamar Valley are being overgrazed…. The battle between National Park Service officials and Montana stockmen has been real and pronounced for years, long before Wenk came on the scene. 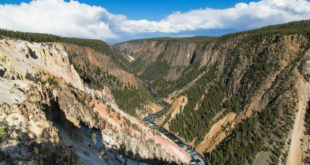 Wenk had announced his retirement in the face of a potential reassignment as part of a Department of the Interior shakeup — a move that he intended to keep him in Yellowstone through March 30, 2019. Bison management is just one of the many issues facing Wenk and now his replacement.